There are a number of compelling reasons why cancer of the pancreas may be a particularly good model for the development of gene therapy strategies. First, the genetic basis of pancreatic cancer is becoming very well characterized because of intense activity in laboratories around the world (reviewed in refs. 1 and 2), and each oncogene and tumor-suppressor gene identified represents a novel target for genetic therapy (3). Second, the recognition that there may be familial inherited predisposition to pancreatic cancer, either alone (4) or in association with other malignancies such as melanoma (5, 6, 7), offers the possibility of prevention by genetic intervention. Third, because of the poor response to conventional treatment and dismal prognosis of the disease, patients and clinicians are willing to explore such new therapies. 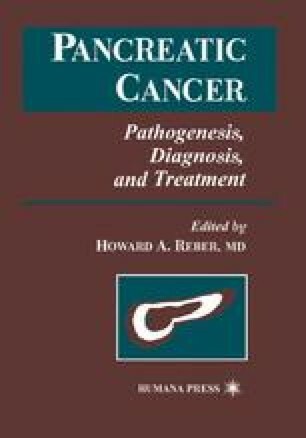 This chapter reviews the latest possibilities for exploiting genetic technology in the treatment and prevention of pancreatic cancer, and highlights the most promising areas for clinical application.